Kevan, Peter G.. "Hornet". The Canadian Encyclopedia, 04 March 2015, Historica Canada. 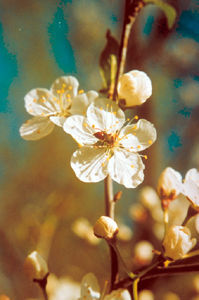 https://www.thecanadianencyclopedia.ca/en/article/hornet. Accessed 21 April 2019. Hornets, of the insect family Vespidae in the order Hymenoptera, are social insects that nest in populous colonies. 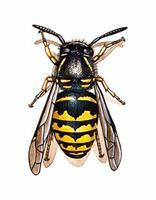 Hornet is the common name for large wasps of the Vespidae family (artwork by Jan Sovak, 1989). Hornets, of the insect family Vespidae in the order Hymenoptera, are social insects that nest in populous colonies. 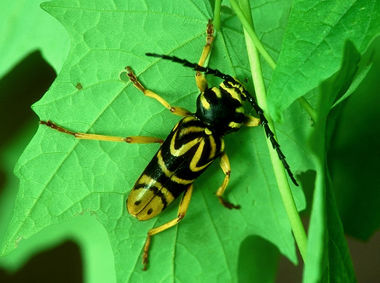 Hornet is the common name for the larger species of wasps. The striking black and white bald-faced hornet (Dolichovespula maculata) is common across Canada. The European hornet (Vespa crabro), a large yellow and black introduced species, is found in some parts of southern Ontario. In addition, queens of various species of yellow jacket wasps, being much larger than workers, are sometimes called hornets. Each colony of hornets has a reproductive egg-laying queen, female but sexually sterile workers, and, mostly later in summer, males or drones. In the fall the workers and males die, but young, mated queens hibernate. In spring, the mated queens initiate the new colonies. Hornets build nests of wood fibres masticated into coarse paper, usually greyish in colour. Nests are attached to trees or shrubs, or suspended from eaves. Some may build in cavities in walls, hollow trees or under the ground. The conspicuous nests of hornets and yellow jackets are large globous structures that enclose and protect the brood-rearing parts of the nest and form the home for the insects. Even those that are built in concealed locations have a papery protective sheath. All hornets are carnivorous, feeding voraciously on other insects. 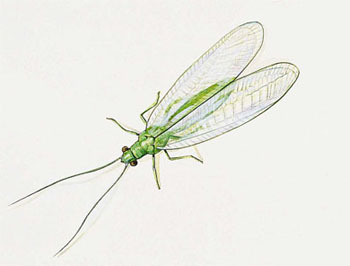 Thus, they are beneficial insects in that they consume crop and garden pests.